A group of students in the Equine Program at Olds College are putting on a presentation about the Alberta Wild Horses. 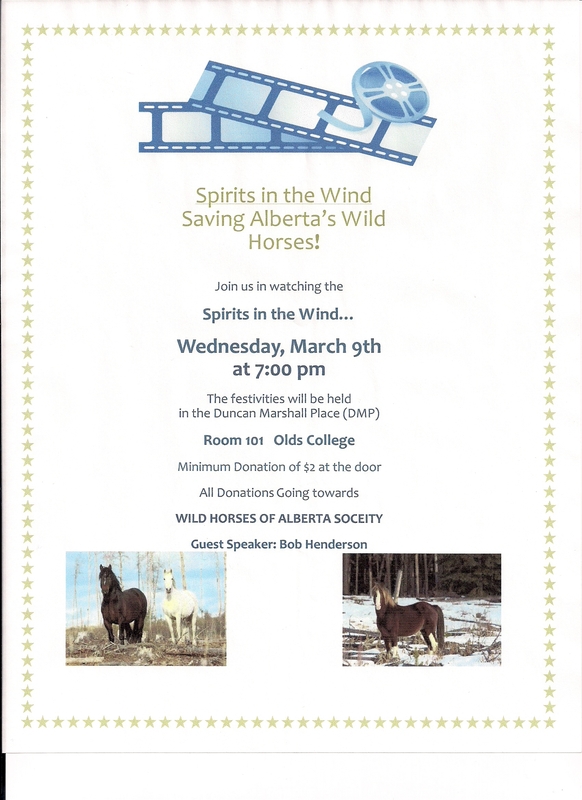 The night will feature a screening of Michael Nietzel’s film “Spirits in the Wind”, which is about our wild horses and the difficulties they are facing. I will also be there to field questions about the film and the wild horses at the conclusion of the film. I have attached a copy of the poster they have circulated outlining all the information about their event. I am very grateful to these young students for the caring and interest they have in trying to protect the Wild Horses of Alberta. Some of these students travelled all the way to Banff on January 13, under adverse conditions, to support me as I participated in a panel discussion at the Banff Centre. It is also noted that they are circulating a petition that asks the Government of Alberta to stop the needless capturing of these horses. They hope to have 500 signatures on this petition by March 9, 2011. I still believe that it is this generation that will make the difference in saving all aspects of our environment. Thank you.